This food rich in polyunsaturated fats has a beneficial effect on blood pressure. 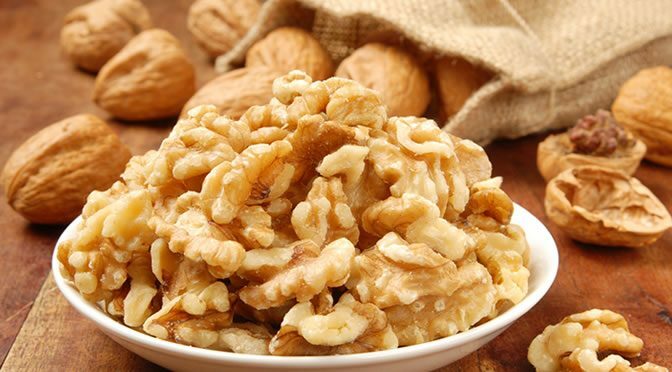 Walnuts and walnut oil in the diet can help the body’s response to stress, research finds. The average daily serving in the study was 1.3 ounces (37 grams), which is about 9 whole walnuts and a tablespoon of walnut oil. Several studies have shown the importance of alpha linolenic acid in lowering low density lipoproteins (LDL), also known as the bad cholesterol. Alpha linolenic acid is an omega-3 fatty acid found in plants such as flaxseeds and walnuts. In addition, these foods can also lower biomarkers such as c-reactive protein, which rise in response to inflammation and stress. “People who show an exaggerated biological response to stress are at higher risk of heart disease. For the study 22 healthy adults with high levels of LDL cholesterol took part. They did two stress tests; one stressor was immersing their foot in ice-cold water and the other was giving a speech while being videotaped. Adding walnuts and walnut oil to the diet lowered blood pressure during the stress tests. However, including flaxseed oil to the walnut diet didn’t show any further improvement in reducing blood pressure. “This is the first study to show that walnuts and walnut oil reduce blood pressure during stress. This is important because we can’t avoid all of the stressors in our daily lives. Further tests showed that adding flax oil to the walnut diet lowered c-reactive protein and the risk of heart disease. Participants consumed three random diets and the tests were carried out at the end of each six-week diet. The first was a diet without nuts reflecting a typical person’s diet in the US. The second replaced some of the protein and fat in the diet with 37 grams of walnuts and a tablespoon of walnut oil. For the third diet, in addition to walnuts and walnut oil, 1.5 tablespoons of flaxseed oil was added. All these three diets were matched for calories to ensure no weight gain or loss would occur. These were mixed in the foods such as pesto, salad dressing, baked goods or consumed as a snack. The beneficial effects on blood pressure could be due to compounds such antioxidants, fibre, alpha linolenic acid and unsaturated fatty acids found in walnuts . “These results are in agreement with several recent studies showing that walnuts can reduce cholesterol and blood pressure. The study was published in the Journal of the American College of Nutrition (West et al., 2010).